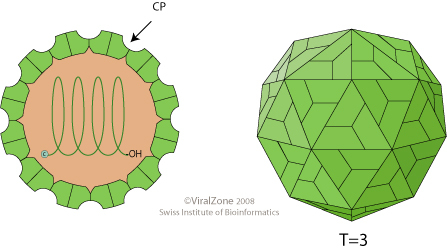 Non enveloped virion, about 30 nm in diameter with a T=3 icosahedral symmetry (180 protein subunits). RNA1 and RNA2 are copackaged into the same virion and both are required for infectivity. Segmented, bipartite linear ssRNA(+) genome composed of RNA1=3.1 kb and RNA2=1.4 kb. Each genome segment 5' end is capped. The 3’end has no poly (A) tract. ORIGIN OF NAME Noda is from Nodamura, a japanese village where NoV was isolated. NATURAL HOSTS Insects, mammals, fishes. ASSOCIATED DISEASES NoV: paralysis in infected wax moth larvae. Can provoke paralysis and death to suckling mice and suckling hamsters. Nodamuravirus protein B2 and Flock house virus protein B2 act as suppressors of RNA silencing .